In a rush? want something healthy? something that you can have in the fridge the night before and take it to lunch? – yep, this salad ticks all the boxes. I am a big believer in cooking once – eating twice (or thrice)! 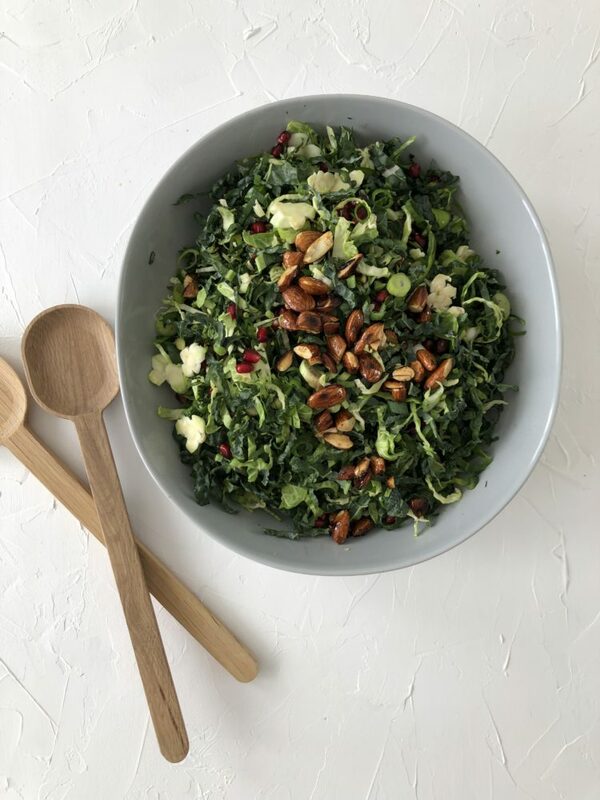 Kale and brussel sprouts are hearty vegetables, they can handle sitting in the work fridge all day without getting soggy! Talk about a win! What I love about this recipe is that the ingredients support nutrient intakes, help move waste out of the body and provide the body with several serves of delicious veggies! The brussel sprouts support liver health, the chili warms the digestive system, the pumpkin seeds provide zinc and the dulse iodine. However, there are a couple of things missing from this salad – protein and good fats to mention a two. This salad is not a complete meal, its here to boost a meal. I had it with oven roasted salmon, adding some hemp seeds and avocado. You could have it with organic chicken breast or keep it vegetarian and add chickpeas or another legume. . . . because when it comes to health, balance is always key. A special mention about kale; if you have known thyroid issues or presume that you do firstly get your thyroid checked, but secondly raw kale may not be the most suited vegetable for you. The addition of dulse flakes supports extra iodine intake. This recipe is Gluten free, Dairy free, Grain free, Paleo, Vegan, Summer loving and supports elimination pathways. Lemon, olive oil as dressing. 1. Finely chop all the green ingredients, add to a salad bowl. 2. Add pomegranate, buckwheat, Dulse, pumpkin seeds. 4. Dress when ready and enjoy. If you are enjoying your salad the next day you are able to dress it and place it in a glass container ready to go, or leave the dressing off – gently massage the salad, box it up and keep dressing in a little glass jar to add later.